Integrate contactless card payment system (EZ-Link, PayFlash, PayWave) for your business product and service. Elevate your business productivity through an automated cashier. Hire a cashier to work for you 24 hours a day, 7 days a week, at a ridiculous monthly rate. No hiring expenses to worry about. With automated machine running the show, your business is longer limited to just office hours. A longer business operation will mean more opportunities for transactions and therefore more revenue. Get immediate access to daily business insight at the tip of your finger. With computation central system, all your automated transaction can be retrieved over the air remotely at the end of every day. The timely sales information helps you to track market trends or sales problems. This provides you with the ability to make a fast decision to improve sales and insight to expand your businesses. 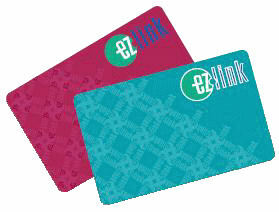 EZ-Link (a CEPAS-compliant card), is a very common contactless card among Singaporean. 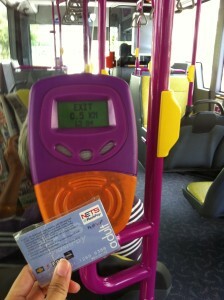 EZ-Link card is the number one public transport payment card in Singapore. It is also a commonly used card for ERP system (Electronic Road Pricing), and public/private car park payment system in Singapore. Integrate EZ-Link card to your business, and provide your customer with a more convenience means to buy your product and services. There is no cash or shortage of change for your customer to worry about. All transactions are computerised and complete electronically. Business accounting will be faster and easier. EZ-Link the most commonly used payment card in Singapore can help expand your business locally. FlashPay card payment (a CEPAS-compliant card) is another common contactless card payment method in Singapore. Many of the FlashPay terminals can be found in the foodcourt, hawker centre, shopping mall, FairPrice Xpress, 7-Eleven & Cheers stores, etc… in Singapore. PayWave and PayPass are also contactless card design for credit card application. PayWave is the contactless card name for Visa credit cards network, while PayPass is the contactless card name for MasterCard credit cards network. Besides contactless, credit card can also be authenticated via chip card. Older technology using magnetic stripe card is going obsolete. Integrate your business solution with an automated self-service payment system and let the system run by itself. You can integrate EZ-Link payment to vending machine, coin or notes acceptor machine or any other machinary equipment. 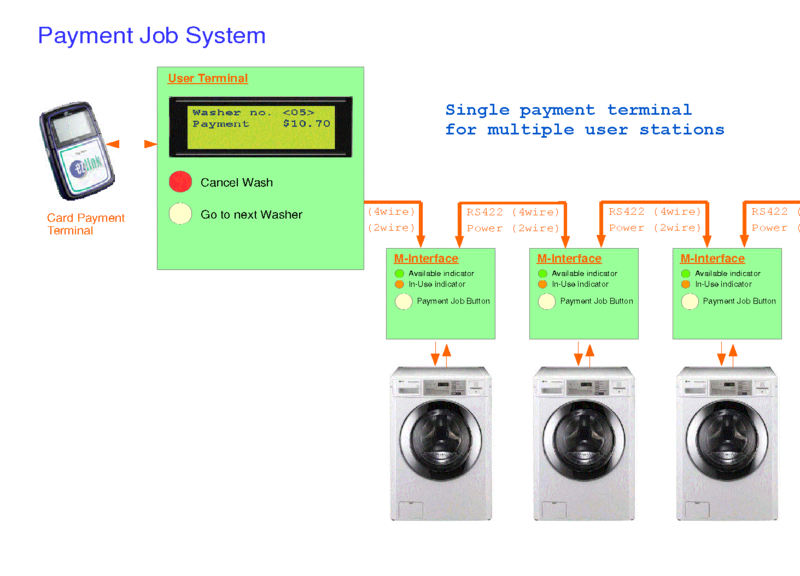 The following illustrates a self-service clothes washing shop. The washer and dryer machines are integrated with the EZ-Link payment terminal. Such system can also be deployed in a student hostel or worker’s dormitory. The shop operates 24 hours a day without the need for anyone to look after the shop daily. This provides your customers with the convenience of having their clothes washed/dried anytime of the day they want. All transaction are done electronically. This means that there is no dollar notes or coins shortage to worry about. At the end of the day, sales report from the various remote location can be sent back to your central office. Any accounting or business decision can be faster and simpler. Maintenance can be carried out on a monthly or quarterly basis. The laundry equipment is from Prime Power Pte. Ltd., the laundromat market leader in self-service automated washer and dryer system from LG. Fresh Laundry Pte. 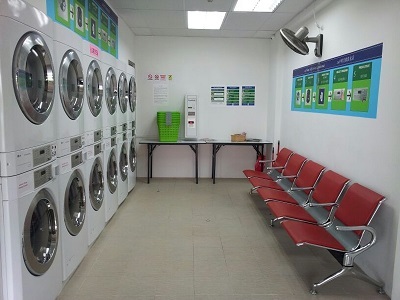 Ltd. also provides Speed Queen washing/dryer machine purchase and rental for schools, hostel and workers dormitory. A custom designed electronic circuit board allows all the washer and dryer machine to be connected to a single EZ-Link payment terminal. The sharing of a single payment terminal reduces the maintenance cost of having a terminal for each machine. 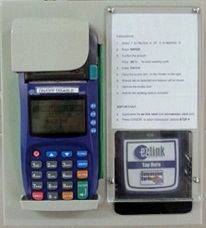 The EZ-Link payment terminal from Card Techno is custom programmed for the washing and drying services. Integrate your business with a payment terminal today for a new level of productivity!!! Yes, we can, PIC-CONTROL can integrate any form of electrical and electronic system that your business is currently using. 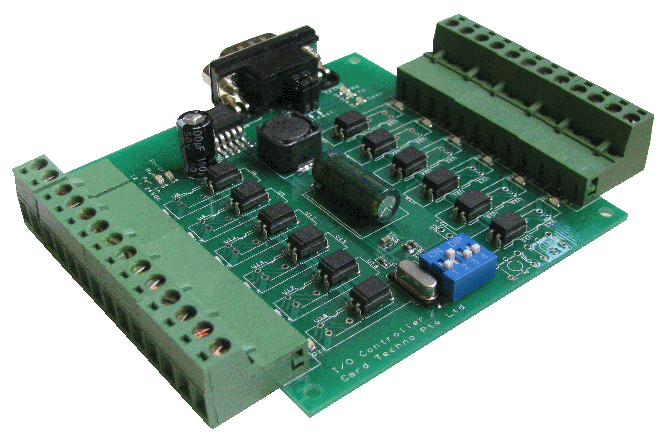 We are the expert in the area of electronic design and integration. Contact PIC-CONTROL today. Enable your service or product to automate cashier through EZ-Link cash card. Vending system integration for an automated self-service payment 24 hours a day. Check out our cashless payment system rental package here (at $5-$8 per day).